Our webhost limits us to sending a certain number of emails per day. Once this limit is crossed, we are not able to send any activation emails until the next day. If you registered an account, and got a "Message delivery failed..." error, or didn't receive your activation code for any other reason, then please submit the form below. Your activation code will then be sent to your email. Do not abuse the flagging system. Be polite, you'll get back what you give. Keep your conversation topics appropriate. No sharing of inappropriate videos and/or pictures. Do not discuss other Pokemon RPGs. Do not advertise other websites. Failure to follow these rules will result in a ban from the chat. You will need an RPG account to access the chat page. 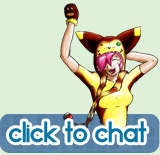 For a mobile compatible version of the chat, click here. Pokémon © 1995 - 2016 Nintendo/Creatures Inc./Game Freak Inc. Pokemon Voyage Online RPG does not claim to own Pokémon. Pokemon Voyage Online RPG Programming © 2011 - 2016 "Kakashi" [Hassan Khan]. Trade Script [create and complete trades] © "iPokemon" [Bennett Treptow]; modified by "Kakashi."